In my article titled “Coolest Monkey” Hoodie: 8 Ways Fashion Brands Can Avoid H & M’s Dreaded PR Nightmare addressing the H&M hoodie controversy, one of the tips I discussed was that fashion advertisers should avoid the presumption that black people are a monolithic group. A Swedish Black has a completely different experience and worldview than a British or American black person. It is why, as I pointed out, fashion advertisers should ensure they research the foreign markets they want to do business in, and solicit tastemakers/influencers in the targeted market to critique their products before introducing it into the marketplace. As I pointed out in my aforementioned article, a Black/African person in Sweden, based on that country’s history with racial discrimination involving blacks, may not see the big deal that a black child is wearing a hoodie with “coolest monkey in the jungle” inscribed on it. 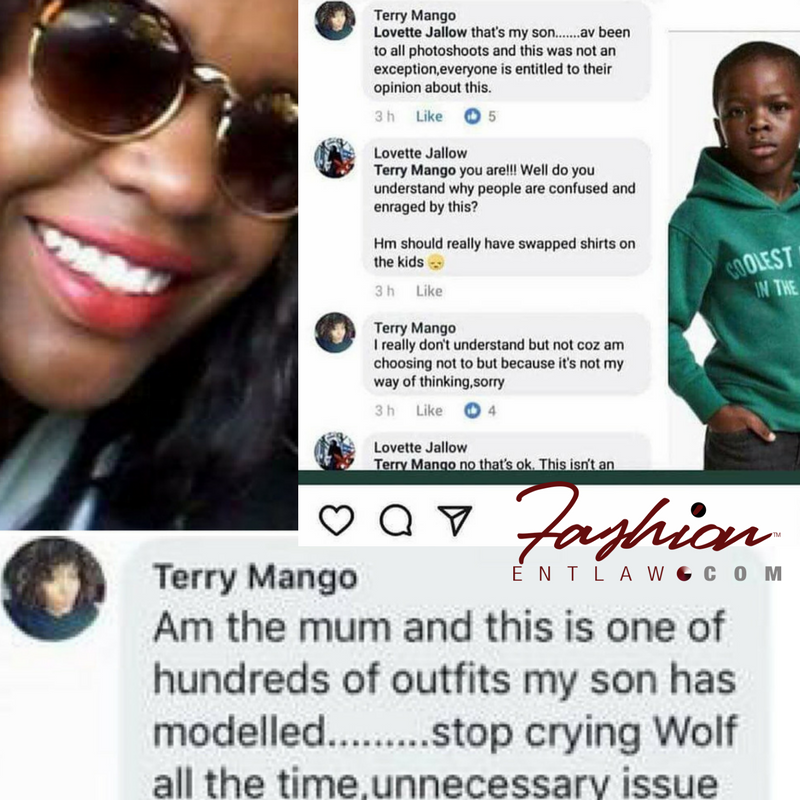 Mango went on to explain that she has attended all of her son’s modeling gigs, was present during this particular photoshoot; and saw nothing wrong with the hoodie and ad. She further explained that she is not wired to view the world through a racism or lack thereof lens, and urged people to “get over it”. When some members of the public descended on her with insults, she changed her account settings to private. Is it possible that this Kenyan mom is truthful about her worldview/philosophy? Yes…and I believe her. It is my experience, as a person of African heritage, that many Africans often feel removed from the racism discourse and their default position where covert racism is involved is not to acknowledge or even believe it exists. It is why, often, you may see an African who migrates to a western country observe covert racism and not connect the dots. If someone else connects the dots and raises it, even among fellow Africans, they are told to either “get over it”, or “work harder” so they will not experience racism. Racism has to be overt, i.e. hit them right in the face for them to get it. That attitude, however, is beginning to change among youths thanks to the proliferation of technology (social media included), which affords these youths numerous opportunities to observe, in real time, discriminatory acts against black people, especially in western countries. So, again, I am not surprised by the mother’s response. Suffice it to say, however, that her response is completely irrelevant to you reading this if you happen to be a fashion advertiser or fashion brand owner. In the final analysis, the multicultural consumer market you target (wherever they may be found), is the one that gets to tell you whether they believe your ad is racist or not. In this instance, that multicultural consumer target audience has spoken. They do not like H & M’s ad and are choosing to call for a boycott, shop, and affiliate their influential brands and money elsewhere.